Fine Gael website Hacked by Anonymous hackers ! Ireland's main opposition party's website has been hacked into by a group which has recently come to prominence for attacks on companies related to the WikiLeaks controversy. Up to 2,000 people's personal details were compromised in the attack by the hackers, known as Anonymous, Fine Gael said. The American internet firm ElectionMall, which reported the cyber attack to US authorities, has informed the party that the FBI is now involved in the investigation. A statement from Fine Gael confirmed that its site, Finegael.com had been compromised by the Anonymous group, which has backed WikiLeaks and its founder Julian Assange against attempts by the United States government to stop the leaking of sensitive American diplomatic cables. Anonymous has launched attacks on the websites of companies such as Visa, Mastercard and Amazon over allegations that they acted against WikiLeaks. Fine Gael has contacted the office of the data protection commissioner Billy Hawkes following the website attack, which is investigating. It also contacted the Garda computer crime unit in relation to the incident. In a statement, Fine Gael said it had this morning emailed all of those affected to notify them. 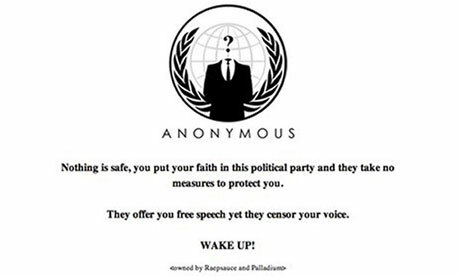 There appears to be no obvious reason why Anonymous have targeted Fine Gael, the party most likely to be the major force in a new coalition following this year's Irish general election which will be held in March.